Ludhiana: The Punjab police have reportedly invoked Unlawful Activities Prevention Act (UAPA) in case related to the killing of a Ghawaddi village women who was accused in a case related to beadbi of Guru Granth Sahib in October 2015. Namely :- Harbans Singh of Kalle Majra (Nabha), Gurvinder Singh and Jagjit Singh of Herike village in Sangrur district. Trio were presented before a local court of judge Lovejinder Kaur along with Gurpreet Singh and Nihal Singh who had surrendered before the court few days back. The police alleged that the arrested persons were receiving funds from abroad and they were involved in ‘unlawful activities’ as defined under the UAPA. The police had sought police remand of 7 days. After hearing the arguments of police and the defence, the court send all five persons on 4 days remand till 7 August. Advo. Manjhpur maintained that Gurpreet Singh and Jaspreet Singh administered third degree torture by the police. “We have moved an application in the court seeking directions to the Senior Medical Officer (SMO) to constitute a board of doctors to conduct medical examination of Gurpreet Singh and Jaspreet Singh”, he added. Advo. Manjhpur further said that he had sough permissions to meet arrested persons on daily basis during their remand period. “The Court has granted us permission that I, as a counsel, could meet all the five persons at CIA Ludhiana every evening during their remand period” he added. Pictures and videos :- Large Numbers Of Police And CRPF Surrounded Kotakpura. 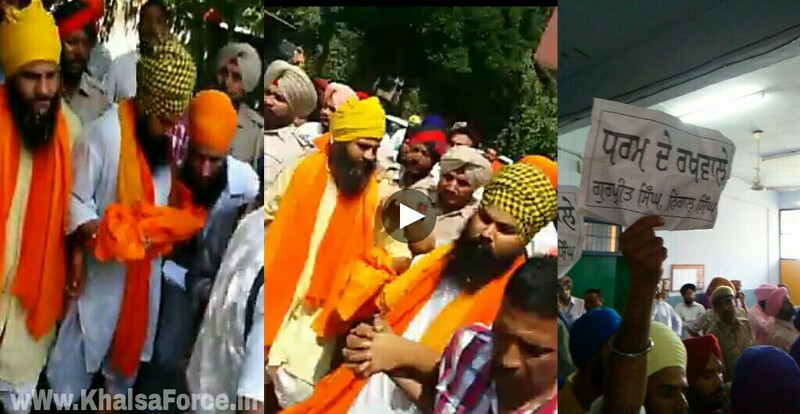 ; Sikh Leaders Were To Be Arrested To Break The Crowd.